Gene Dykes, shown here running the Scotiabank Toronto Waterfront Marathon. Gene Dykes, a 70-year-old running machine and retired computer programmer from Bala Cynwyd, set a world record for his age group on Dec. 15 by running a 2:54:23 marathon. Before we move on, let’s run that back: Gene Dykes is a 70-year-old man who ran a marathon in under three hours. Must be something in this Philadelphia County water. Dykes’ phenomenal race at the Jacksonville Marathon over the race broke a 14-year record thought by many to be unbreakable. 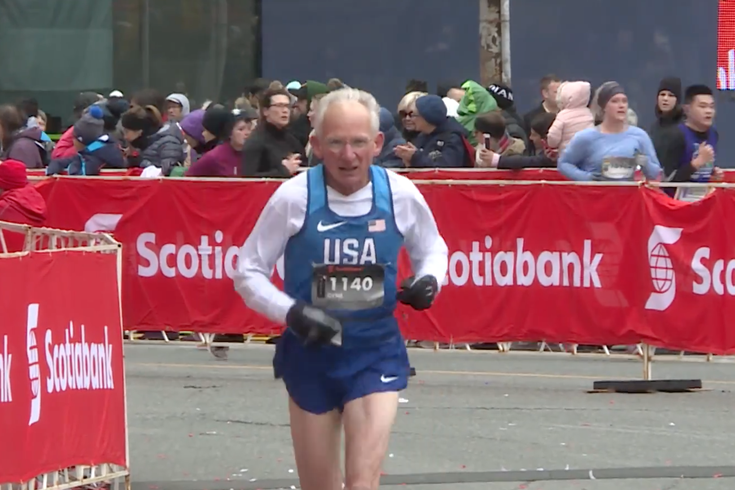 Dykes shattered Canadian distance runner Ed Whitlock’s world record for a marathon by a 70-year-old by 25 seconds, averaging 6:39 per mile. Interestingly, Dykes has only been seriously training for distance running for about five years. He ran high school track in Ohio and then at Lehigh University, but he took a break for dozens of years from dedicated racing, according to the Bucks County Courier Times. Dykes got back into the swing of running in 2004, and started consistently racing around 2011. In 2013 he hired a coach. The rest is history, and now it’s in the record books.